Coad Bog is rich in Sphagnum mosses, bog bean, royal fern, St. John’s wort and insect-eating sundews. IPCC is currently fundraising to complete the legal registration of the site and to compile all of the information gained during the BioBlitz into a Conservation Report and Plan which will help to protect the bog for future generations to enjoy. If you would like to donate please follow this link. 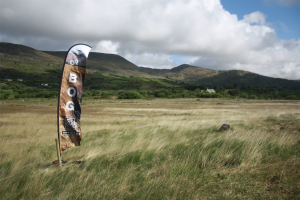 IPCC would like to thank and acknowledge all those friends of the bog who have supported our work on Coad Bog. We gratefully acknowledge the support of the Environmental Protection Agency and the Irish Environmental Network Capacity-building fund. 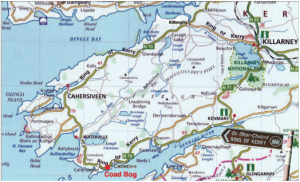 Coad Bog was donated to the Irish Peatland Conservation Council (IPCC) in 2015 by a supporter who has roots in Kerry. Coad is a blanket bog and is 4ha in extent. Blanket bog habitat is rare in Europe and is a conservation priority. 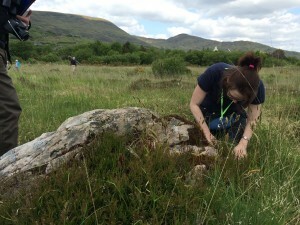 8% of the global area of blanket bog occurs in Ireland and Coad Bog is part of this internationally important resource. Coad Bog is made of peat, plants and water combined together. Peat is the accumulation of partially decayed plants over thousands of years. The dead plants don’t rot because the agents of decay are prevented from working in waterlogged conditions, low in oxygen. Rainfall mixed with sea spray is the main source of water to the bog. With at least 1600mm of rainfall each year, these wet conditions promoted the development of Coad Bog on poorly drained soil derived from Old Red Sandstone. The peat in Coad is up to 4m deep in places but may be only a few centimetres thick where outcrops of Old Red Sandstone are present. 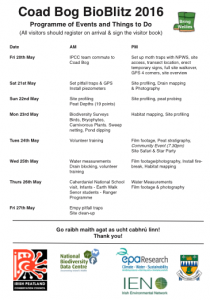 Over 200 species of wildlife have been recorded on Coad Bog. The Pygmy Shrew scurries around in the shrubby areas at the edge of the bog. These tiny mammals feed on insects and spiders. They have to eat 1.25 times their own body weight per day to survive! 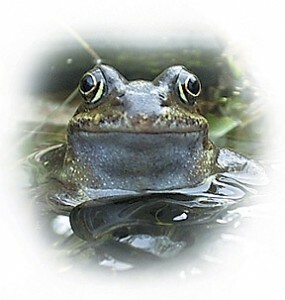 Frogs are commonly seen hunting on the bog surface but they return to water to breed. The Common Lizard may be seen basking on rocks. 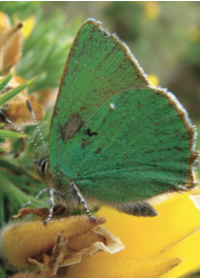 On a sunny day butterflies such as the Orange-Tip and Green Hairstreak can be seen flying over the bog. On mild nights the bog is alive with moths such as the Poplar Hawk Moth, Mother Shipton and the Dark Marbled Carpet. In the bog pools and streams Diving Beetles, Dragonfly and Damselfly Nymphs, Caddisfly Larvae and Water Boatmen are found. Coad Bog is packed full of wonderful creatures to discover. Coad Bog has 13 different habitats such as rocky outcrop, swampy bog, grassland and stream. Some rare and fascinating mosses grow here. During a BioBlitz in 2016, the expert Rory Hodd identified 69 different mosses and liverworts on Coad Bog. These included 9 Sphagnum mosses – the peat forming moss and also Anomalous Flapwort, a species usually found in the Irish midlands. Among the mosses, insect eating Sundew plants are found. These catch midges on their sticky leaves. The beautiful song of the Skylark can be heard as it ascends into the skies above the bog. These musical birds build nests in the grasses on the bog. Meadow Pipits are also seen and heard on Coad Bog. Snipe, known as bog bleaters, use their tail feathers to make a bleating sound as they fly above their nesting sites, marking territory. When disturbed Snipe fly away in a distinctive zig zag pattern. They stick their long bills into the soft peat in search of food. Turf was hand cut from Coad bog in the 19th century by the local blacksmith. Today the bog is threatened by man in many different ways such as drainage, fire, hand cutting of peat, telegraph pole maintenance, dumping and invasive plants. IPCC have received a warm welcome to Coad Bog from the local communities of Castlecove and Caherdaniel. Many came forward to volunteer on the site with great enthusiasm. 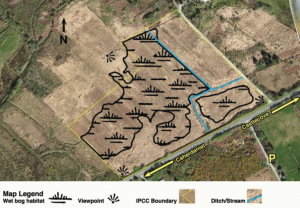 IPCC are confident that Coad Bog will be protected given their interest in the project. IPCC want to ensure Coad Bog is a haven for wildlife so that future generations can enjoy it. 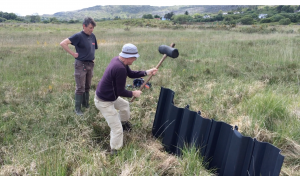 Dipwells to monitor water levels in the bog have been installed. A drain has been blocked and work has begun on creating a fire break. IPCC will continue to monitor and enhance flora and fauna on the bog by creating suitable habitat and maintaining high water levels year round. IPCC have completed a first draft of the Conservation Management Plan for Coad Bog, you can download the draft plan here. Please feel free to send comments and suggestions to Katie at bogs@ipcc.ie before the 30th September, your feedback is important to us. While the Irish Peatland Conservation Council warmly welcome visitors to Coad Bog we would like to remind you of the needs and privacy of local residents and to acknowledge the interests of local land owners. Here are a few tips to ensure you have a safe visit and to help protect Coad Bog and its wildlife so that future generations can enjoy it too. Please do not park on public roads. See map showing available parking. 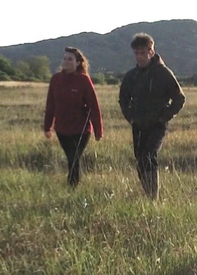 Walking pets without leads, camping, fires and the use of mo- torised vehicles on the bog are pro- hibited as they disturb wildlife. It is an offence to feed or molest wildlife or to remove or otherwise disturb any natural feature or plant on the bog. It is dangerous to walk on the bog surface owing to hidden ditches, soft uneven ground, 4,000 year old pine stumps, pools, drains and brambles. Fences and walls keep some animals in and some out, use stiles and gates (and shut them after you please). Weather conditions can change rapidly. Are you prepared? Coad Bog is adjacent to the N70 which is an extremely busy road so please take care if walking on or crossing the road.